The celebration of Mass on Sunday is, for Catholics, the centre of the week. Mass is celebrated at St Cuthbert’s for the Student Community every Sunday during term at 6:30pm with the Chaplaincy Choir; outside term the Mass is a little quieter. At the Student Mass the servers, readers, choir, extraordinary ministers of Holy Communion and welcomers are all drawn from the student community. If you can help, or would like to know more about these ministries, please get in touch with the Catholic Society Vice-President. There is also a Parish Mass throughout the year for the local parish community at 10:00am, and all are welcome at either Mass. Mass is usually celebrated daily during the week at 9:15am on Saturdays; 12:15pm on Tuesdays, Thursdays and Fridays; and 7:00pm on Wednesdays. 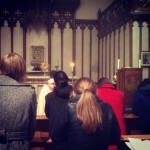 The Wednesday evening Mass during University Term is usually sung with simple chants, and is followed by the Catholic Society’s main mid-week gathering, “CathSoc Night”. Weekday Mass times (and occasionally venues – sometimes we celebrate in the colleges) are subject to change: please see the right hand column of this page for the times over the next week. The Blessed Sacrament is exposed before Mass on Wednesday evenings (i.e. c. 6:30pm – 6:55pm) during term, Advent and Lent; the Sacrament of Penance (Confession) is also available in this period. or by appointment, or usually on call. On Tuesday mornings during term, the Catholic Society celebrates Lauds (Morning Prayer). Lauds lasts about 15-20 minutes. Books and instruction are provided if necessary – please arrive a few minutes early and we will sort you out. The Catholic Society organises a breakfast after Lauds. On Fridays during Lent, Vespers is celebrated at 6.10pm, with Stations of the Cross at 6.30pm.